Hulas Rahul Gupta is battling for survival. The Managing Director of IndoSolar, the country's largest manufacturer of solar cells, has been forced to down shutters at his factory in Greater Noida. He had no choice after his order book dried up. Gupta now spends his days in meetings to convince bankers that he can revive his business. And, when he's not doing that, he is meeting people in power to push for restricting rival Chinese firms from dumping their cheaper products into India. India's solar energy sector is being buffeted by winds of change, some good and some really bad. The government, on its part, has been announcing new policies that are sure to benefit new players in the field but existing players, especially manufacturers, assert they've been given a raw deal. IndoSolar, for instance, lost Rs 58 crore in the last fiscal and that's after previous losses to the tune of Rs 141 crore. Policy changes that affected manufacturers adversely were not restricted to just Indian government decisions. China recently hit the brakes on its solar programme, halting quota allocations for new projects and announcing tariff reductions of as much as 9 per cent on electricity generated from clean energy. That could lead to a further fall in solar panel prices globally, which will impact Indian panel manufacturers. "My bankers are knocking at the door. If the government doesn't bring safeguards and a favourable manufacturing policy, we will vanish," says Gupta. He asserts that Indian domestic manufacturers have been left out of the party, though the sector (solar energy) remains quite dynamic; installed capacity zoomed over eightfold from 2.63 GW in 2014/15 to 21.65 GW by the end of 2017/180; at least 70 GW will be tendered in the next few years. Gupta isn't the only one who has been hurt by incentives that exclude existing domestic players. Kolkata-based cell manufacturer, Jupiter Solar Power Ltd, has been struggling to avoid having to shut operations since last July. Moser Baer, among the largest manufacturers of panels, sought restructuring to the tune of Rs 956 crore in 2012/13, but the recast failed a few years later. India's manufacturing capacity utilisation is dismal. Only about 10 per cent of the potential 3.1 GW solar cell manufacturing capacity is used; similarly, only a quarter of the solar panel manufacturing capacity is utilised. In June 2014, the Minister for New and Renewable Energy, Piyush Goyal, met domestic manufacturers. He wanted them to withdraw their petition asking for hefty anti-dumping duty on Chinese imports in the solar sector. The manufacturers did so believing the government would increase the size of the pie and they would fare better. Four years down the line, says Gupta, nothing has changed. In January, India pushed interim safeguard duty of 70 per cent but this was later challenged by Shapoorji Pallonji group in the Madras High Court. Now, the stay is vacated and India is moving towards a final duty. Indian Solar Manufacturers Association (ISMA) feels that domestic players have lost out in the past four months. They are preparing for filing a fresh petition seeking anti-dumping duties as well. Despite starting manufacturing solar cells and panels in 2010, the domestic industry was for years largely dependent on government-backed projects that mandated local sourcing. Two years later, the government allowed imports; and in 2014/15, when the government insisted on reverse bidding for solar parks, domestic players were edged out by the Chinese who aggressively offered everything much cheaper. When the last fiscal ended, domestic manufacturers' share in the Indian solar market had shrunk from 13 per cent to a mere 7 per cent. When the EU and then the US created tariff barriers, India became the natural choice for aggressive bidders for solar parks. Close on the heels of the EU imposing steep import tariffs and restrictions on Chinese solar products, the US initiated its own trade war with the Chinese. The result is that the EU and the US, whose purchases jointly accounted for 32 per cent of China's solar market, now account for just 5 per cent. On the other hand, India, which earlier bought only 3 per cent Chinese production, now accounts for nearly 35 per cent. Chinese cells are nearly 25 per cent cheaper. Moreover, China, with its massive capacity, is pushing modules, which are much cheaper. The trade war also resulted in a market disruption and a sharp drop in solar power price. In May last year, a Rajasthan bid touched `2.47 per unit, effectively meaning solar power prices were on par with coal. 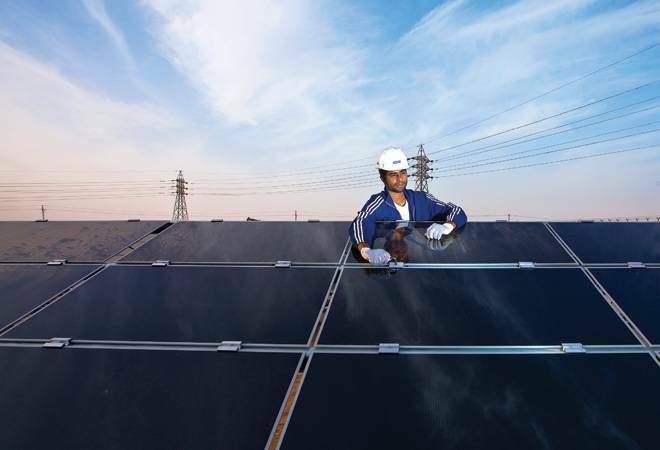 With panel prices dropping from $1.8 per watt in 2010 to lower than 20 cents per watt, in the past four years, India imported nearly 16 GW of panels from China. And worsening the situation for Gupta and other domestic manufacturers is the fact that most domestic panel manufacturers also rely on cheap imported wafers and cells from China and Taiwan. Several operators refusing to be named told BT that they are willing to support Indian manufacturers if they can be assured of volumes. On June 8, the government made cell and panel manufacturers sit together to find an amicable solution but the effort didn't yield results. In the next two years, India will tender nearly 100 GW of solar generation capacity to meet targets. That's a challenge because India's manufacturing capacity is uncompetitive. Reason: a) none of the existing players can fund the drastic necessary expansion and upgrades, b) manufacturing is capital intensive, requiring not just subsidies but also cheaper electricity, cheaper funds and, obviously, scale c) there are no backward linkages and hardly any capacity to manufacture components such as wafers, ingots, poly-silicon and glass. The US and EU, along with China, ran intense capacity building programmes and now hardly have space for imports. India's solar manufacturing policy is still only a work in progress. And in the meantime, last June, the Finance Ministry refused to pay a Rs 20,000 crore capital-subsidy portion citing funds crunch. Minister for New and Renewable Energy, R.K. Singh, however, told BT that the government was committed to helping domestic manufacturers grow. This, he said, could take the shape of "increased domestic manufacturing link projects and updated manufacturing policy''. Just days after Singh spoke to BT, the Solar Energy Corporation of India announced a plan in which it invited panel 'manufacturing bids for 5 GW capacity and generation of double' - meaning an entity can bid to manufacture 5 GW and bid for 10 GW worth of generation units as well. But this is insufficient, say current players. The bid document requires two bank guarantees of `400 crore for generation projects and `200 crore for manufacturing projects. The CEO of Jupiter Solar Power Ltd, Dhruv Sharma, asks, "How can you expect existing players battling debt to get bank guarantees for these amounts?" Even as existing players feel they have been hung out to dry, government representatives say the new policy aims to accelerate manufacturing by offering new manufacturing link projects. This, they contend, will open doors for larger players like the Adani Group (with units in Gujarat) and Tata Power. Investments could also be coming in solar equipment manufacturing with the Softbank Corp-GCL tie-up. The challenge of access to cheaper funds and capital subsidies, however, still looms large on the solar horizon.